Incessant increase in milk production after the formation of COMFED, Bihar necessitated the need of an institution for production of dairy professionals in the state. The government of Bihar conceptualized Sanjay Gandhi Institute of Dairy Technology and approved the same vide resolution No. 2813, dated- 14th December, 1980. The institute became operational as one of the constituent units of Rajendra Agricultural University, Pusa, Samastipur and the first batch of undergraduate students in Dairy Technology was admitted in the year 1982. The institute was shifted to Patna in 1986 and finally moved to its own campus at Jagdeo Path, Patna-14 in the year 1999. 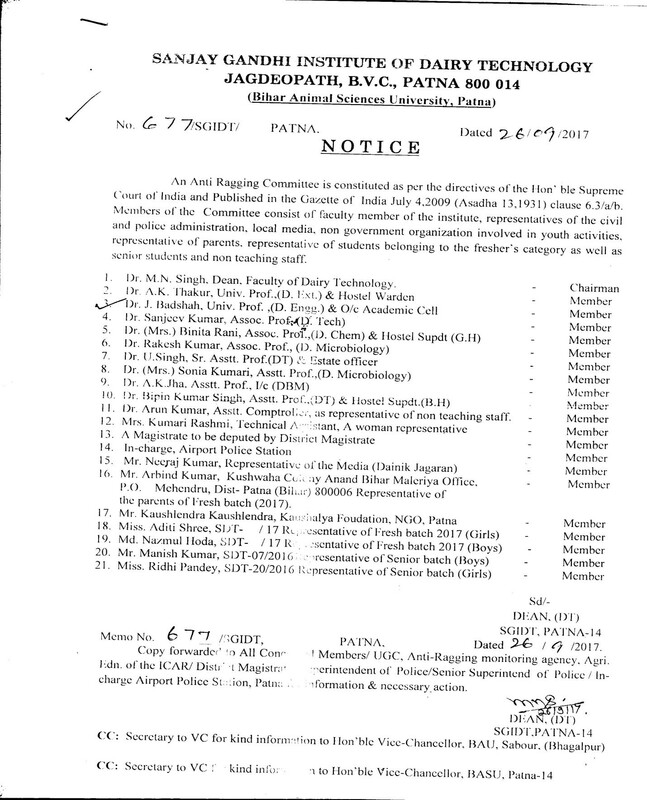 After bifurcation of RAU, Pusa, the institute came under the purview of Bihar Agricultural University, Sabour, Bhagalpur in the year 2010. 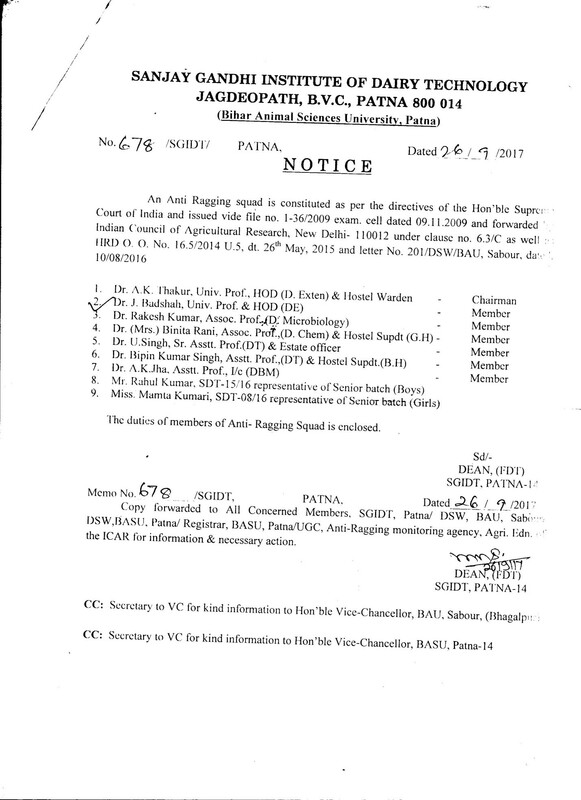 Finally, Bihar Animal Sciences University, Patna has been carved out to by emphasis on research and education in animal sciences and allied station in the state. 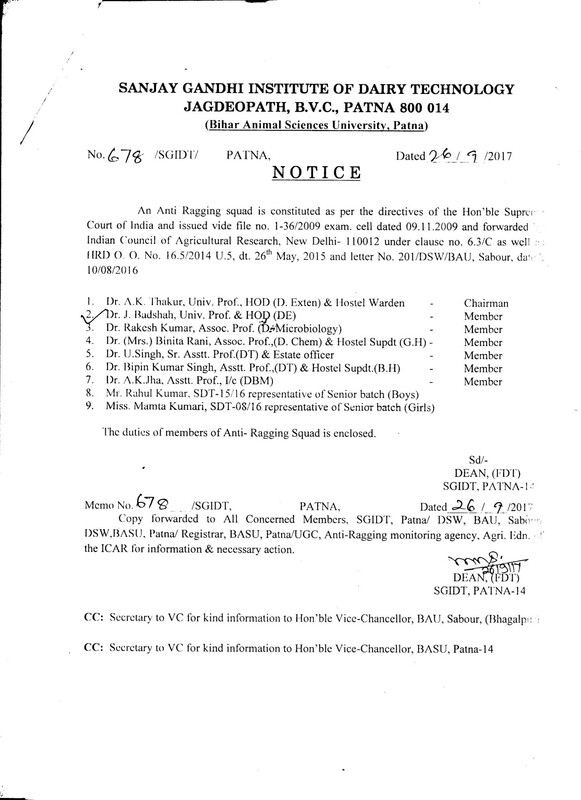 The institute is now under the purview of Bihar Animal Sciences University (BASU), Patna since its formation, it has produced more than 500 graduates who are serving in the various capacities nationally and internationally. The institute is ICAR accredited and offers courses as per the recommendations of Dean’s Committee of ICAR. The institute has recently commenced the Post Graduate Programme in Dairy Technology. Training personnel in dairy technology and dairy husbandry in order to handle dairy development programs in the state of Bihar. Providing short term training to dairy farmers, dairy entrepreneurs and dairy technicians as and when required. Conducting under graduate and post graduate programs in the selected areas of dairy science as per requirement of the state. Carrying out research in collaboration with related disciplines on various aspects of dairy science and technology. Disseminating the scientific knowledge in relation to milk and milk products through extension education programs. The institute has three air conditioned classroom having audio visual presentation equipments and modern facilities. A new lecture theater complex is under construction that shall be having one large hall on ground floor of 175 seats that may be utilized as auditorium as well as for organizing seminars, meetings etc. Two 48 seated lecture halls on first floor having all modern AV facilities and acoustics are also coming up. Engineering drawing laboratory, workshop laboratory, electrical technology laboratory, fluid mechanic laboratory, and Instrumentation engineering laboratory will be extended in coming up new building of Dairy Engineering department apart from existing dairy and food process engineering laboratory. The Existing library of SGIDT, Patna provides tremendous facilities to support research, teaching, learning, and scholarly communication across various disciplines. The library has aimed to become the informational hub for the students and the staffs of the college to access the national, international journals and periodicals, textbooks and reference books to the students for their course work and research through CeRA. The library has good collection of text books, reference books, few journals, project reports and internet facility for reference purpose. Besides this, there is a central university library of Rajendra Agricultural University at Sabour having good number of books on all the subjects, journals, periodicals, internet facility and CD – ROM reference databases to cater to the need of students as and when required. ICAR and Govt. of Bihar funded Experiential Dairy Plant (10,000 lts / day) with facilities for processing, product development, quality analysis and packaging of milk and milk products, which is under construction. The institute has a well equipped computer centre and is connected through LAN for access to internet. Staff rooms and various laboratories have also been provided with internet connection through LAN. Faculties, students and staffs use this laboratory for training / teaching, computation, report preparation and surfing the net for academic activities. Most of the faculties of the institute have been connected with the local area network (LAN) of the institute to have broadband internet access and other services at their desktop. One new Computer language laboratory has come up in the institute. Adequate hostel facility is available for both boys and girls of UG and PG students. The hostel inmates are provided with Volleyball and Badminton courts, RO drinking water, in-house mess and common room. To provide the facilities for Hands on learning and Experiential Learning and Student Ready programs and Implant Training to students as per the ICAR Vth Dean’s Committee curriculum. To provide placement opportunities to students in Govt. / private sectors. The stipends are generally provided by the organizations imparting training to students. Otherwise, ICAR has made provision to provide stipend for one semester at the rate of Rs. 3000 / per month to those students who have not received stipend from industries.